We are halfway through the month of May, one of the hottest months of the year and that means we need to deal with skin problems like excess oil secretion, acne, blackheads, clogged pores and so many more. But worry not my lovelies as I am here to review a face wash in this post which will definitely help to you keep your skin fresh, clean and non-sticky. It's not a new launch but definitely a saviour in this hot and humid weather. 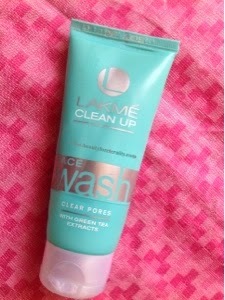 This is Lakme Clean Up Face Wash Clear Pores With Green Tea Extracts which hit the market in 2013 and is appropriate for ongoing summer and approaching monsoon season. I bought it during GOSF in the month of December last year from nykaa.com in a Lakme kit along with a scrub and face mask from the same range for INR 299. Since then it had been kept lying in my drawer along with so many other products from the same haul. I have started to use it for last 3 months only and I have been loving the way it works for my oily to combination skin. It's a must have for summer and monsoon season. Available at: Across all cosmetic retail shops across the country and nykaa.com and various other sites. Product Description: Lakme clean up face wash with green tea extracts is a face wash/face cleanser which is ideal for oily and combination skin. It's gel based light green coloured product which comes in a tube like packaging and is ideal to be used on daily basis to clean the dirt and oil from the face. Packaging: Lakme clean up face wash with green tea extracts comes in an aqua-green colour plastic tube packaging which has a flip open cap that closes securely with a click sound. It's like all other face wash tubes, travel friendly and light weight. It's opacity does not let me keep a check on the amount of the product left but at the same time protects the contents from damaging sun rays. 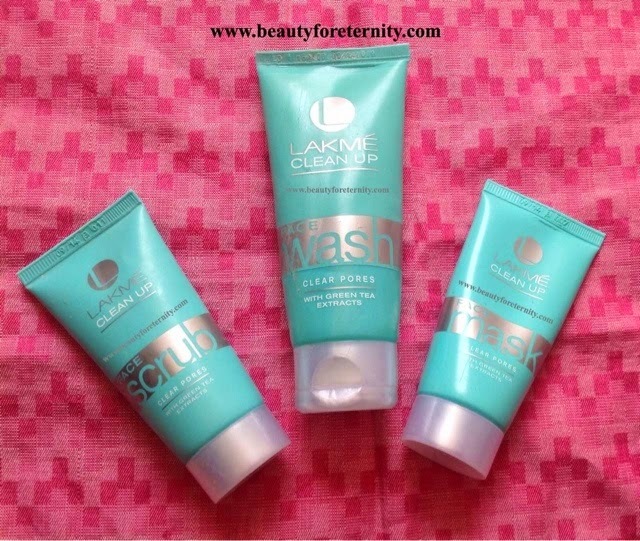 Fragrance: Lakme clean up face wash with green tea extracts has a very soothing and fresh fragrance which feels pleasant and fades away after some time. 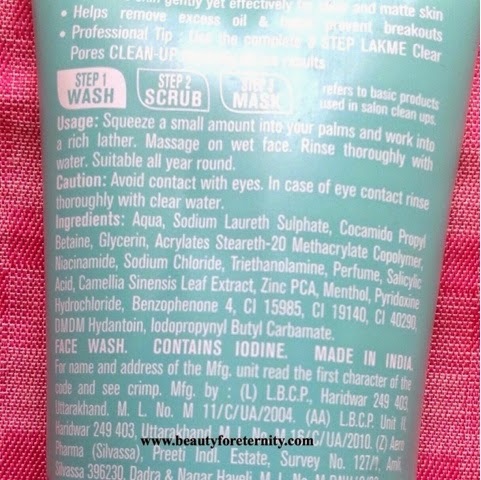 Directions to use Lakme Clean Up Face Wash Clear Pores With Green Tea Extracts: Squeeze out a small amount of the Lakme clean up face wash onto your wet palms and rub to develop a rich lather and apply it on your wet face and neck in the correct way for a minute or so and wash off with lukewarm water. No need to repeat as this product does a fine job of cleansing in the first go. I actually quite liked the Lakme clean up face wash because it contains green tea extracts and it's good for oily and pimple prone skin. Being a green tea freak I could not resist myself from buying it despite of it containing SLES, a chemical ingredient which is not so good for your skin. Being in gel form, it's quite bouncy and has to be squeezed out carefully from the tube due to it's tendency to bounce off. It has happened with me and some product got wasted because it fell down on the floor. Lol. It looks weird but it did happen with me. I needed only a coin size amount for my entire face and neck it formed a nice lather. It cleaned my skin really well and I got the feeling of a fresh, clean, non-oily and smooth skin. Unlike many oil controlling face washes, it never left my skin dry. It removed dirt, oil and makeup completely and also kept my face shine and oil free for 4-5 hours even in summers. Having salicylic acid, it did help me with acne and breakouts also and I actually did not experience any pimples post using this Lakme face wash. It cleansed thoroughly yet gently and did reduce the appearance of visible pores which I had around my nose. I used it in winters also in the month of Feb when my skin was slightly dry and it worked absolutely well for me which I actually had not expected. Overall, this Lakme Clean Up Face Wash Clear Pores With Green Tea Extracts did suit my combination skin beautifully and I am actually quite satisfied with this. 5. Keeps the skin matte for a long time.